Wizard's Tower Intro Pack League! 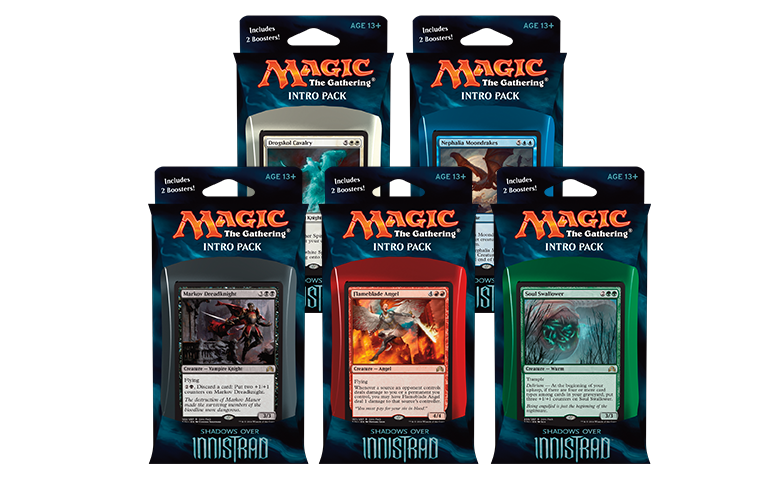 The Intro Pack League is a casual Magic league designed for new players and old alike. Players purchase a season pass, which includes everything one needs to start off in the league. Players meet once every two weeks in order to play a 3 round tournament. Every following meeting, players will open two new packs and modify their decks using the cards in their packs. Prizes are paid out in packs to the top 8 players at the end of the league. Modification of decks can be done during the hour before and after the league matches. Between meetings of the league, decks will be stored on site in order maintain an even playing field for all players. Trading is allowed during modification time, but only on a 1 for 1 basis and only for cards of the same rarity. The League meets on the 1st and 3rd Sunday of the month. Each player starts with an Intro Pack from the current set. The included boosters should be used to modify the Intro Pack deck. Standard deck construction rules apply. Each league meeting after the first, players will open 2 more packs of cards from the current set, in order to modify their current deck. Players may only trade cards during the hour before and after league matches. Players may only trade cards on a 1 for 1 basis, and may only be traded for cards of the same rarity. Mythic rare cards are considered to be rare for the purposes of trading. Matches that run long will be allowed 5 extra turns before declaring a draw. Players may not intentionally draw. At the end of the night each players will place all cards they own from the league into their collector box and turn all cards in to the league organizer/ host. Cards and boxes will be kept at the host location until the next league event. All cards will be given to players to take home at the end of the league. If for any reason a player wishes to leave the league, all cards from the league will be returned to the player in question, they will also receive their remaining non prize packs. Players who drop from the league are no longer eligible to receive prize. A player who misses 3 league events will be considered dropped from the league. The prize pool will consist of 5 packs per player. Prizes are paid out in packs to the top 8 players. Prizes are rounded down based on the number of packs available in the prize pool.